An idle trawl through the Drone library has turned up this amusing contemporary account from Private Eye of Bob Edwards' visit to his colleagues in Manchester in 1965. 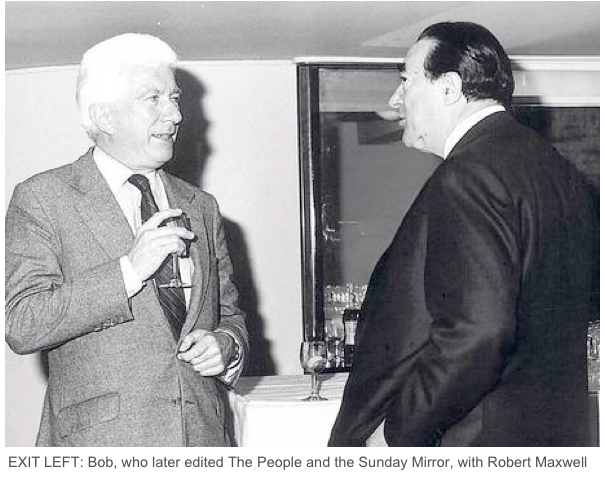 The Eye was not to know that Bob was soon to be fired for the second time as editor of the Daily Express. One suspects that the denizens of the northern Express had an inkling of this. Maundy Thursday was a traditional day off for daily newspapers as they were then not published on the following day, Good Friday. Connoisseurs of Fleet Street will know that the organisation of the Daily Express resembles in many ways that of a Masonic Society. It is perhaps because of this and the secrecy preserved by the members of the ‘Beaver Lodge’ that the details of an extraordinary ‘happening’ in Manchester during Holy Week have only recently filtered through to Private Eye. It is the tradition of the Manchester Daily Express to hold a dinner on the night of Maundy Thursday, a night which it will be remembered, is associated in the Christian calendar with the Last Supper. This year the dinner was held in the Milverton Lodge, a private hotel in Manchester. And to make the thing go with more of a swing, Mr Robert Edwards, Editor of the Daily Express, insisted on attending and addressing with a few well-chosen words the assembled guardians of Free Speech and public liberty. Now it should be known that the provincial Expressmen tend to look on their power-mad colleagues in Fleet Street with some suspicion, not to say contempt. But Mr Edwards did not seem prepared for the shouts of ‘Sieg Heil!’ which echoed round the dining room as he made his triumphal entrance. Nor when the moment came for him to address the gathering did he seem altogether pleased to observe that several persons present were actually sitting on their hands while others gave the slow handclap. As a post-prandial entertainment and a possible antidote to what had gone before, the organisers of the function had lined up a troupe of striptease artistes. As Mr Edwards scowled in his seat, bread rolls and other missiles flew past him on the direction of the performing ladies. Enough was enough. Pausing only to mutter ‘This has gone too far’, Mr Edwards hurriedly left the chamber and caught the next plane to London. Rumour has it that he intends to stay there some time.